An AIS transponder on your boat automatically receives information broadcast by other AIS-equipped vessels and base stations, all while your own vessel's static and dynamic information is being transmitted. AIS signals may reach where radar cannot, showing AIS-equpped vessels that might otherwise be hidden, such as on the other side of an island or behind a larger vessel. SOLAS commercial vessels are already required to carry a Class A AIS transponder, so your position will be known by nearby large vessels. The MA-500TR increases your safety at sea. The Plotter display looks like a marine radar display. North-up, course-up and range zoom from 0.125 NM to 24 NM are supported. The Target list display shows all detected AIS equipped vessels and targets. The Danger list display shows a list of vessels that are within 6 NM CPA and 60 minutes TCPA from your vessel. The Danger list can be sorted by CPA or TCPA order. In addition to these display types, the Detail screen shows various information about the selected AIS target. When a vessel comes into the CPA and TCPA range, the vessel icon blinks on the Plotter display and emits a beep sound. When connected to external audio equipment installed on the deck tower, the collision alarm function will alert you even when you are away from the AIS transponder. When connected to a compatible Icom VHF radio. It's easy to make an individual DSC call. Select a vessel using the MA-500TR's cursor keys and then push the "DSC" button on the MA-500TR. It is not required to input an MMSI number manually. Up to 100 waypoints can be stored on the waypoint list. The "MOB" button allows you to set a waypoint on your current position instantly. When the MA-500TR receives a safety-related message from a Class A AIS transponder, the message icon appears on the Plotter display. Up to 20 received DSC messages are automatically stored in the log memory. 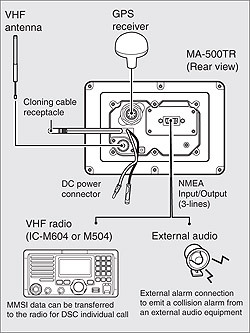 The MA-500TR has 15-pin D-SUB connector providing 3-lines of NMEA input/output on the rear panel. The supplied NMEA connector cable simplifies the installation and connection to the VHF radio and other navigation equipment. The MXG-5000S GPS receiver is a 12 channel parallel GPS receiver with SBAS function.